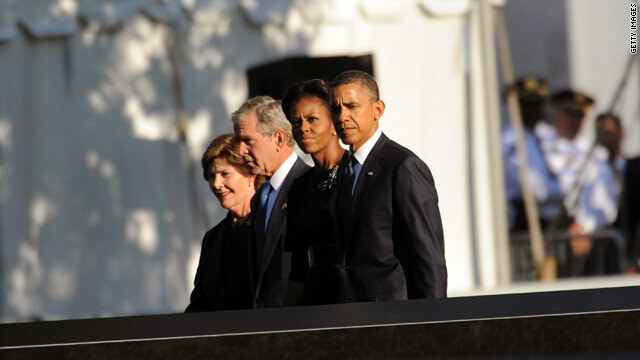 (CNN) – President Barack Obama with former President George W. Bush commemorated the tenth anniversary of the terrorist attacks that took place in New York City on September 11, 2001 in a rare joint appearance Sunday. The presidents, first lady Michelle Obama and Laura Bush were also joined by former President Bush and Laura Bush’s children, Barbara and Jenna Bush Hager, as well as Henry Hager, Jenna's husband. The families observed a moment of silence at the North Memorial pool, which sits in the footprint of the North Tower. Following the moment of silence, President Obama and the first lady greeted surviving family members of 9/11 victims and political leaders including New York Gov. Andrew Cuomo, New Jersey Gov. Chris Christie, and New York City Mayor Michael Bloomberg. Bush never showed a minute of leadership the whole eight years he was in office. Acting like a bully on the world stage is not leadership: its stupidity. Obama doesnot act like a gunslinger and maybe that's what you guys miss. But for me to work with the world is far better then acting like your its god: there is only ONE and GWB is not Him. Some of you Americans are downright disgusting,.. lacking in civility, in compassion, hurling insults, hate filled remarks at each other on such a solemn day, when in fact you should be standing united. You act like a pack of wild dogs, fangs bared, looking to tear each other apart, ..you have fallen right off the map, when it comes to civility towards each other. Get your act together,.. the world is watching and so are your children. Mike, what a foolish remark. The name calling and blaming is uncalled for and has no credibility. People in general make hateful comments, and it has nothing to do with party affiliation. If you really believe what you are saying, I suggest you get your head examined. You either have no clue, or you rather be blind and deaf. Can we all just get a shoe and throw it. 9/11 was the moment Cheney, Rumsfeld and Bush were waiting for. They finally had their reason to attack Iraq even if the did have to fabricate all of the evidence, lie avout Saddams involvement with Al Quaeda and go against a UN vote of no. You knew it was going to happen if you read the letter Rumsfeld wrote to Clinton while Clinton was President demanding he invade Iraq. The nation mourns the loss of 3000 Americans that day. That same year 45,000 Americans died because they didn't have health insurance. In the decade since almost a half million Americans have died because they didn't have health insurance. Nobody will enact a memorial for them or even care that they died. If they lived in any other industrialized nation on the planet theywould probably be alive but since the US is the only industrialized nation in the world without Universal Health Care they were sentenced to death. Thank you Republicans for allowing a half million Americans to die without lifting a finger. What's that you say? Universal Health Care doesn't work and costs more and turns us all into Commies? If that's true why does everybody else have it and cover all citizens? Why does everybody else on the planet pay half what Americans pay for health care? Why are we ranked 37th behind Cosa Rica? Thee are facts. Mourn the 3000 Americans killed and kill 100,000+ in Iraq for their oil and military contracts under the guise of revengeand then blow off your fellow Americans. Isn't America great? Oh man, ok I just read a post blaming republicans for the shrinking middle class. I'm sure some idiot republican on here thinks it's the democrats that are to blame.... Well congrats morons you're both right!!! You see until the industrial revolution there was no middle class in this country. In recent years we as a nation ( not just one party ) have been sending our industry over seas. Which in turn will kill our middle class. It's not one parties grand scheme its both parties failure. It's our faults for falling for the party system. So please for the sake of our nation, our children's nation, stop picking a side in the stupidity of the party system. By February 2003, 74% of Americans supported taking military action to remove Hussein from power. So actually, he was thinking like most everyone else. Just thought you should know. Watching this video, you can definitely pick up on the tension & awkwardness between the two presidents & first ladies. It is most apparent from Michelle Obama. At the end of the video, she distanced herself as far away as she could from the Bushes'. It would have been nice to see her friendly with Laura Bush, since it was Laura who came to her defense when Michelle said "for the first time in my life, I am proud to be an American." Did MIchelle Obama ever thank the former first lady for coming to her defense? I don't think so. Obama is getting advice from the right person. How to get re-elected after failing your first term. I am so proud of President Obama who stands up for America. Obama is a very honorable man he fights for our country's right and freedom and is keeping our country safe. He is NOT the president who started a phony war and had no plan whatsoever to end the war. While P Bush tapped danced on the White House steps our country was being "tanked" into an economical abyss. Just the same, it was honorable that both presidents stood together for America at our tenth anniversary of most horrible acts put upon our country. Dear God, can't we stop the hating for one day? I am very partisan, because I believe one "side" has a more effective philosophy of governing rooted in a more realistc understanding of the world. That said, the fighting has got to stop. We all live here. We'll never make the other side "go away." EVER. It's time to generate more light than heat in our discussions and really try to work together. did everyone forget that bin laden, hussain, diem, shaw of iran, noriega, mubarack, etc. were all U.S. pupets until they disobeyed their owners? maybe if we all recognized that perpetual war/media entertainment blurs our viewpoint to what groups gain from all this horror, we will see war profiteers for what they are. 9/11 was an evil thing. FDR said nothing happens in politics without proper planning. well unlike 99% of the people in these comments, I thank the true heroes of 9/11 for what they did and what they stood for on that day and the days to follow. clintons administration should probably shoulder some of the blame, but should reagan and bush sr not take some as well for policies and actions that lead to alot of the hate and mistrust that caused these attacks? best place for obama is one step behind Bush since obama couldnt be a leader he is nothing but a wanna be. Thank you, President Bush, for your courageous, committed leadership to keep us safe after 9/11. You ALWAYS honored the American spirit and character - NEVER apologized for our great country - ALWAYS proud of her - there was decency in the land then. Now (seemingly with top leadership's "permission") too many misguided folks bash our wonderful America - how utterly sad and disgusting! I honestly wish they would go to the land somewhere on this planet that they consider more ideal than the U.S. PLEASE ! Leave already! You know what? I was going to give up the bickering yesterday, but now it's today! No, diridi the shrub is not the best most honorable or whatever silliness you wrote about him. This is the man that months after the 9/11 attack and after dead or alive told a camera crew that he didn't lose sleep over bin laden and it was not the most important thing on his mind(?) (or something to that effect). Obama gave the go ahead and the Navy Seals killed bin laden while the shrub was cutting brush on his ranch!!! And yes, 9/11 was not a victory, it was a disaster of huge proportions. Bringing the devil bin laden down that WAS A VICTORY! Enough of this crapola from the right. The man who created the mess and the man who is fixing it. You are right. Bush NEVER apologized. He ignored conflicting truth to lead dozens of nations into a costly, deadly war he had wanted long before 9/11. Then, after he embarassed our nation in front of the world for starting a war for false reasons, he never even said "oops". No wonder he is in the consideration for worst president ever. It was a wonderful sight to see both the Persidents together. Thouh Obama was very nasty on Bush, Bush made Obama's transition to white house as easy as it could be; he never made any public statements against Obama. Bush did not find pleasure in the death of Osama Bin Laden;he might have been sympathetic to a poerful mind wasted in fanaticism. If I remember correctly, this tragedy occurred on Bush's watch. He is a FAKE HERO as Krugman points out so well. He should not be up there. Bush made America weaker.